No doubt you have read of the historic houses in Spitalfields, of the historic church and the famous old market? Now – thanks to Fiona Atkins and her daughter Jenny at Townhouse in Fournier St – I am able to tell you about the historic cakes of Spitalfields. And the great beauty of this investigation into the baking of past times is that, rather involving the painstaking restoration of crumbling old piles, it can be accomplished in the kitchen where, with a little experimentation, the cakes can be baked afresh. Naturally, I was eager to volunteer myself as a research assistant, in the conscientious pursuit of this endeavour, by offering my services in tasting the historic cakes once they were lifted, newly baked, from the oven. 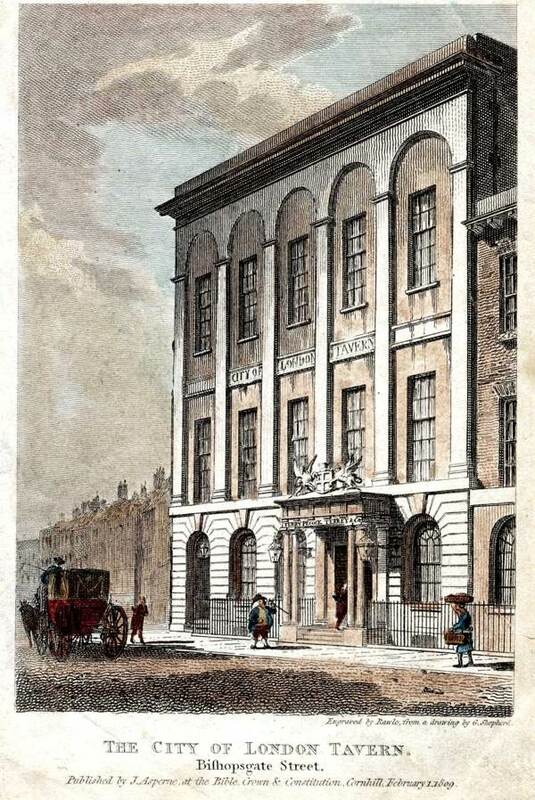 Towards the end of the eighteenth century, The London Tavern – on the west side of Bishopsgate at its southern-most extremity – was the principal destination for dining in the City, catering for as many as five hundred at a time, and when John Farley, the ambitious head cook, published ‘The London Art of Cookery,” he initiated the familiar modern trend of a chef producing a book which promotes his restaurant. 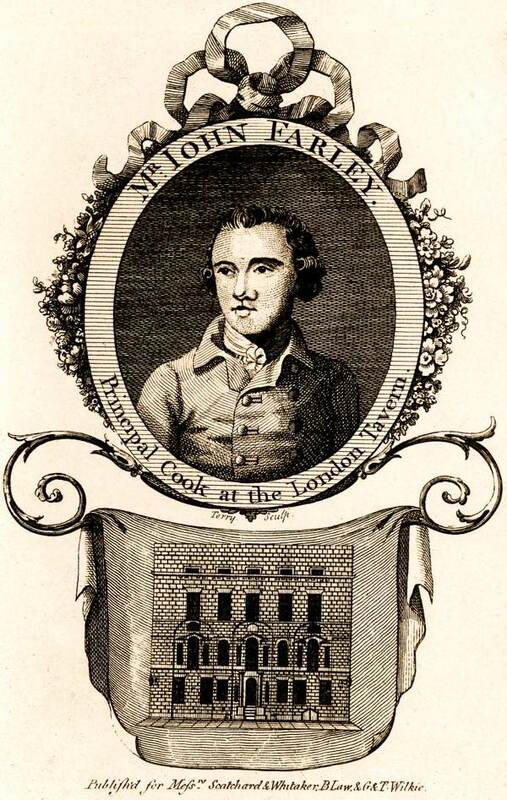 Farley achieved great success with his cookery book running to many editions and it was a comprehensive volume, listing produce through the seasons and proposing menus for every month, as well as offering advice on culinary poisons, sustenance for the sick and recipes for seafarers. 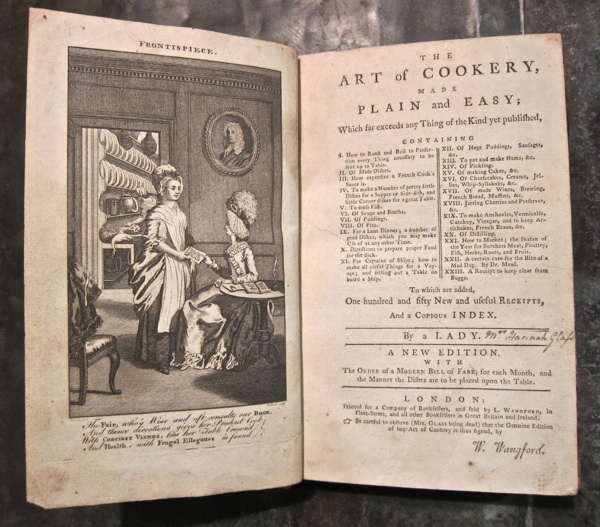 Yet, pursuing her researches further as her collection grew, Fiona Atkins discovered that John Farley was unscrupulous as well as ambitious, lifting most of his recipes directly from earlier cookery books, specifically Hannah Glasse’s “The Art of Cookery Made Plain & Easy”of 1747 and Elizabeth Raffald’s “The Experienced English Housekeeper” of 1769. Farley took recipes from both these writers and simply altered the first and last sentences of each. Once Jenny Atkins saw her mother lay these titles by John Farley, Elizabeth Raffald and Hannah Glasse upon the kitchen table in Fournier St, she was inspired to put the stolen recipes into practice and make manifest these enigmatic confections, as served in Spitalfields over two centuries ago. And when I visited Townhouse last week, I was greeted by the warm honey-sweet aroma of baking as I stepped through the door. Already, there was an impressive array of cakes upon the table to greet me as I descended to the basement kitchen, hung with a collection of copper jelly moulds and old pans. “The most difficult part is the baking itself because our ovens are different,” admitted Jenny, cutting into the centre of a Fine Cake to discover if was cooked through. And although she concluded it needed more baking next time, the slice I enjoyed had a delicious fluffy texture reminiscent in colour and texture of panettone. Jenny told me that the little buns upon a cake stand, sparkling in the morning sunlight, were French Biscuits.“What they call biscuits we call buns,” she informed me helpfully as I bit a tasty morsel from one of these cakes that had a subtle chewy crust, a little like that on a Madeleine, and a dense spongy interior which reminded me of a soft version of biscotti. Next, I moved on to the Little Plum Cakes which perversely do not contain plums but currants. 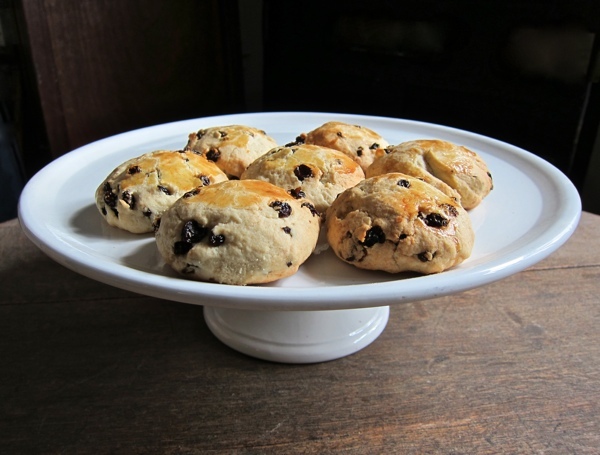 These reminded me of the rock cakes that old ladies made for me as a child in Devon, yet they had a nuttier chewier texture and – stemming from an age before baking powder – to some they may seem a little heavy, while to others with a healthy appetite they might be satisfyingly substantial. Certainly, I did not require any lunch after my assiduous cake research that morning. 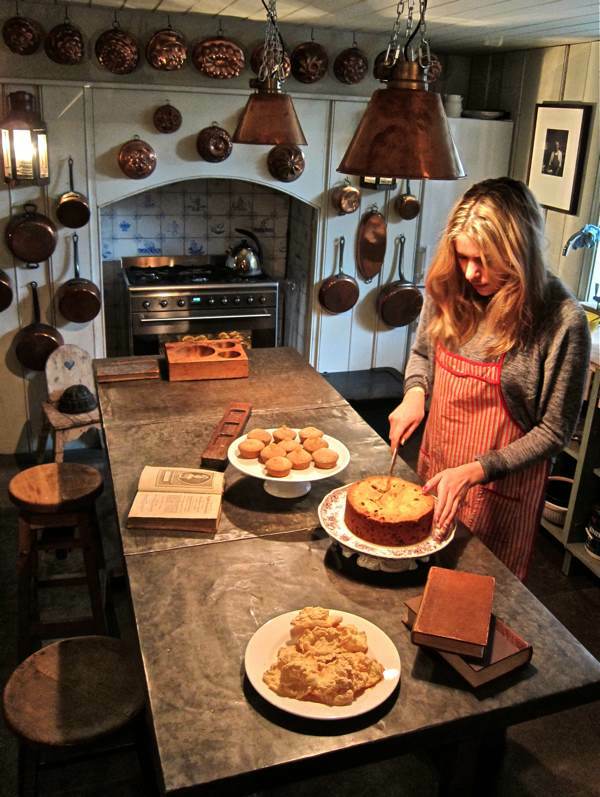 “The idea of cookery books was different then, they weren’t to teach how to cook but to give ideas to people who were clearly well-practised and knew what they were doing.” revealed Jenny – not an entirely inexperienced baker herself- as we sat surrounded by cakes on plates and stands. “I don’t think women used recipes in the way they do now, they read them once to glean ideas and they knew what to do,” she added, leafing through the old cook books and becoming absorbed by them. It was my pleasure to participate in Jenny’s experiment, because it is apparent that frequent testing and informed judgement is required with these recipes. Just as cookery books were first compiled from manuscript recipe books, women copied recipes from cookery books back into their own personal manuscript books, each cook making the recipes their own – a process that is now mirrored as Jenny recreates these recipes under different circumstances to delight the taste of a different age. So this is where your participation in this culinary investigation is required. You are all invited to come along to Townhouse in Fournier St, enjoy a light refreshment and contribute your own considered opinions upon the historic cakes of Spitalfields. 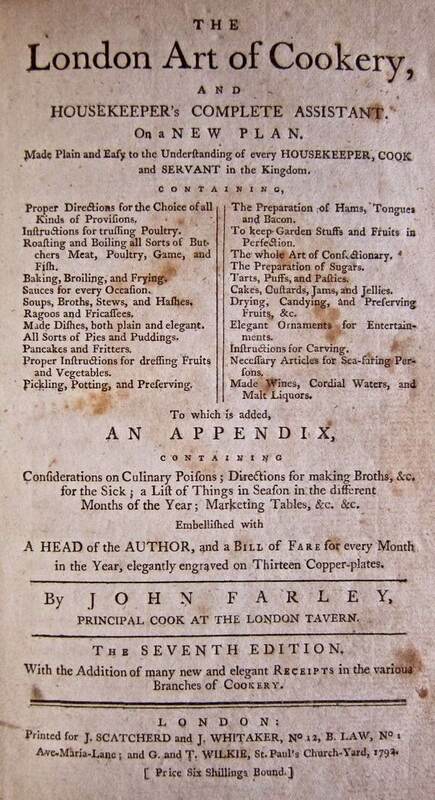 John Farley’s ‘The London Art of Cookery,’ recipes from the London Tavern in Bishopsgate, 1783. French Biscuits – Take a pair of clean scales, in one scale put three new-laid eggs, and in the other the same weight of dried flour. Have ready the same weight of fine powdered sugar. First beat up the white of the eggs well with a whisk, till they be of a fine froth. Then whip in half an ounce of lemon candied peel cut very thin and fine, and beat well. Then, by degrees, whip in the flour and the sugar, then put in the yokes and with a spoon temper them well together. Then shape your biscuits on fin white paper with your spoon, and throw powdered sugar over them. Bake them in a moderate oven, not too hot, giving them a fine colour on the top. When they be baked, with a fine knife cut them off from the paper, and lay them up for use in dry boxes. 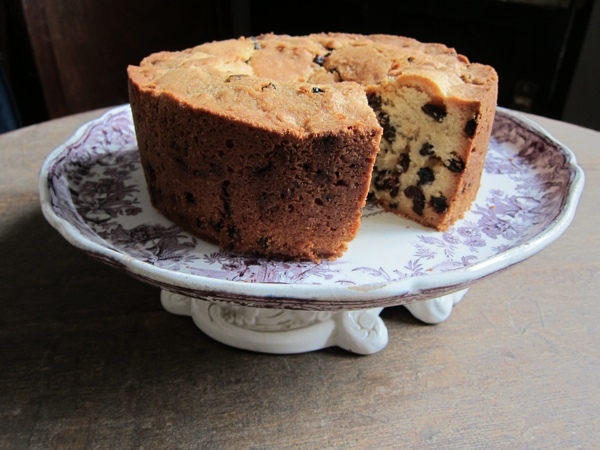 Fine Cake - Take a pound of butter beaten to a cream, a pound and a quarter of flour, a pound of sugar beat fine, a pound of currants, clean washed and picked and the yokes of six and the whites of four eggs. Beat them fine and mix the flour, sugar and eggs, by degrees, into the butter. Beat all well with both hands. Or you may make it thus – Take a pound of flour and a half pound of sugar, beat half a pound of butter with your hand, and mix them well together. Little Plum Cakes – Take half a pound of sugar finely powdered, two pounds of flour well dried, four yolks and two whites of eggs, half a pound of butter washed with rose water, six spoonfuls of cream warmed and a pound and half of currants unwashed, but picked and rubbed very clean in a cloth. Mix all well together, then make them up into cakes, bake them in a hot oven and let them stand half an hour till they be coloured on both sides. Then take down the oven lid and let them stand to soak. You must rub the butter well into the flour, then the eggs and the cream, and then the currants. At the kitchen of Townhouse in Fournier St. The mould in the foreground is for biscuits. 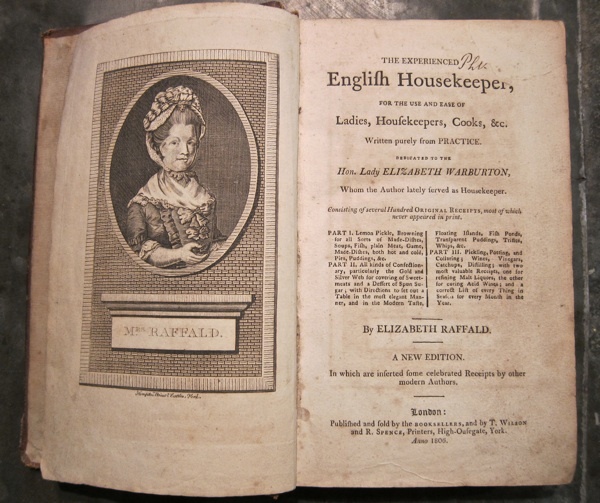 Elizabeth Raffald’s “The Experienced English Housekeeper” of 1769. 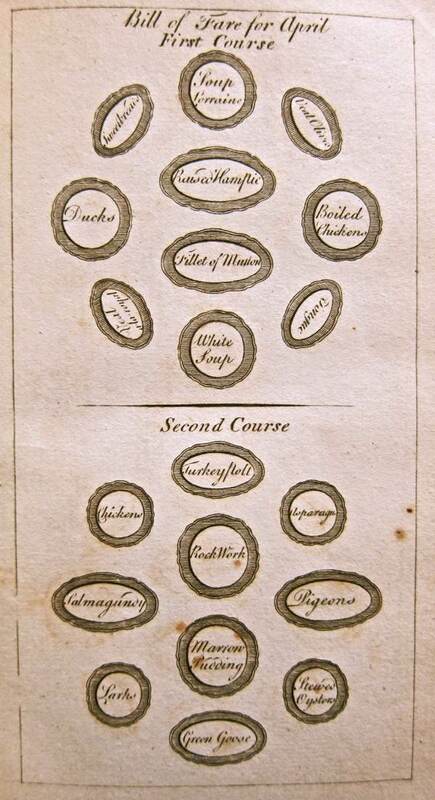 Hannah Glasse’s “The Art of Cookery Made Plain & Easy”of 1747. 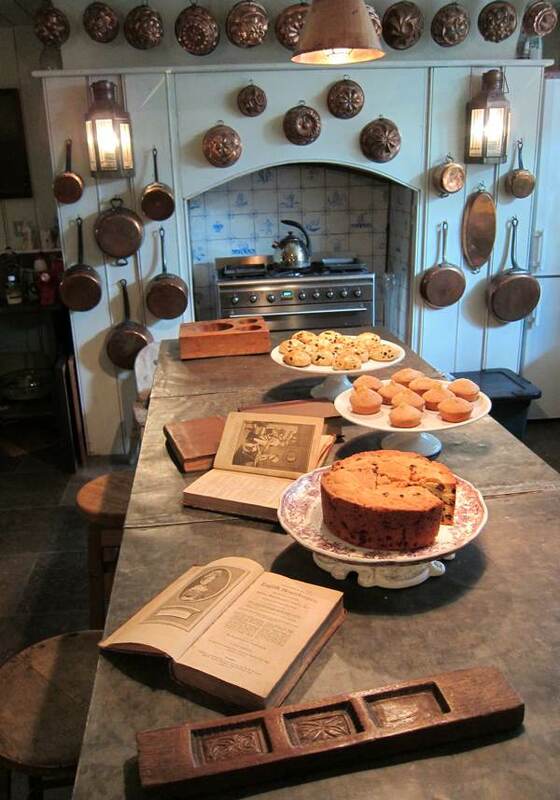 Fiona Atkins’ collection of early cookery books and manuscript recipe books is currently on display at Townhouse, 5 Fournier St, where visitors can partake of coffee and historic cakes baked by Jenny Atkins. You can also book to stay in the rooms above Townhouse by clicking here. how interesting to think americans have cleaned london out of MS recipe books; i have been aware since i was a tiny tot reading my mother’s MS recipe books — or, looking at them before i could read — how they were as you say, the stories of women’s work otherwise unrecorded. laura shapiro — Perfection Salad — a wonderful book about how americans (fannie farmer) quantified recipes and invented “home” “economics” in an era when such was one of the few jobs open to women. oh and plagiarizing the work of others is a tradition in cook books. madeleine kamman dedicated her feminist manifesto, When Frenchwomen Cook, to the mother and grandmother of Paul Bocuse, from whose trad peasant recipes (chicken with vinegar) bocuse bogarted his entire career. what lovely photos and sweet scents! thank you. Mmmmmmm! I’m feeling hungry now! Those cakes look delicious. Not sure I could eat Pigeons or Larks as offered in the “Second Course” though! The inventor of baking powder ought to be more celebrated. I tried a Little Plum Cake at your Rough Trade coffee morning and it was a distinct chewing challenge! I am interested in the biscuit mould – we have circular moulds like this in Scotland, usually with a thistle carved in the middle, for making shortbread. Fascinating article. I am going to attempt the French Biscuits tomorrow. They sound devine. 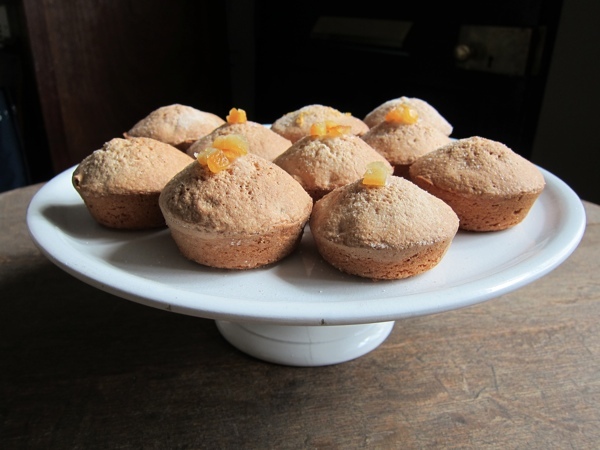 I have a recipe on my blog for Somerset Easter Cakes which look very like the little plum cakes. My recipe is from a book called Cattern Cakes and Lace which is a reproduction of old recipes. The uniquely ‘Somerset’ part was, apparently, the addition of Cassia (a poor man’s cinnamon), which makes lovely spicy cakes that are something like a cross between a biscuit, a scone and a traditional fairy cake. As you said, I think most cooks would read a recipe book and then do their own thing! I have to say I do much the same today, but I suspect it’s down to how confident you are in your own cooking ability?